Four weeks after Navy SEALs had killed Osama bin Laden, the President of the United States stood in Arlington National Cemetery. In his Memorial Day address, he extolled the courage and sacrifice of the two young men buried side by side in the graves before him: Travis Manion, a fallen US Marine, and Brendan Looney, a fallen US Navy SEAL. Although they were killed three years apart, one in Iraq and one in Afghanistan, these two best friends and former roommates were now buried together--"brothers forever." Award-winning journalist Tom Sileo and Travis's father, former Marine colonel Tom Manion, come together to tell thisd intimate story, from Travis's incredible heroism on the streets of Fallujah to Brendan's anguished Navy SEAL training in the wake of his friend's death and his own heroism in the mountains of Afghanistan. 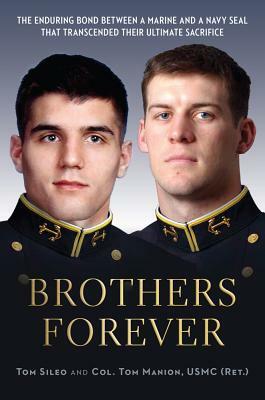 Brothers Forever is a remarkable story of friendship, family, and war. Tom Sileo is senior editor of The Stream. He is a former syndicated columnist and founder of The Unknown Soldiers blog. He lives in Georgia.Colonel Tom Manion, USMC (Ret. ), is chairman emeritus of the Travis Manion Foundation. He lives in Pennsylvania.